So, we totally buy our avocados at Costco. When you have a five year old who eats 1-2 per day, you need to buy in bulk. But, sometimes he just isn’t feeling it and we are left with a bunch of avocados and no idea what to do with them. We can only eat so much guacamole after all. 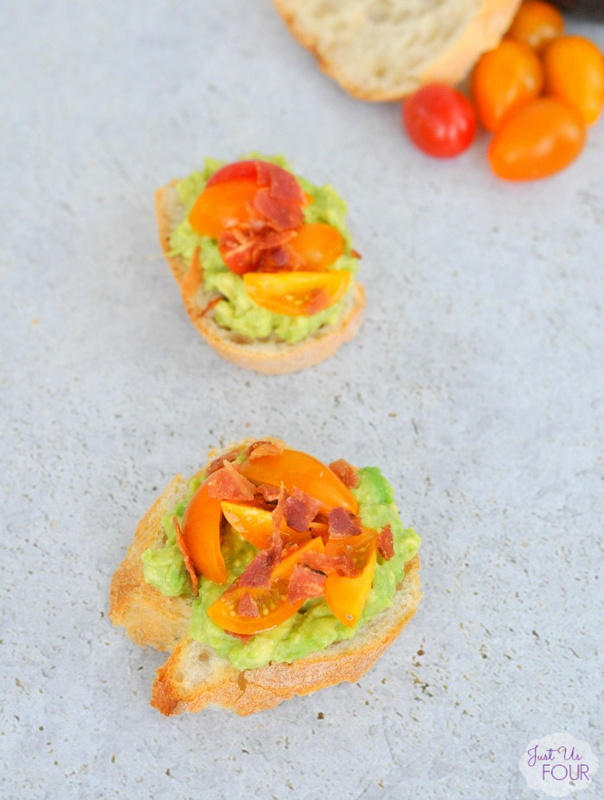 I was having friends over recently and decided to put them to good use by making bacon avocado crostini. This recipe is absolutely perfect for a last minute get together or to throw together for girl’s night in. 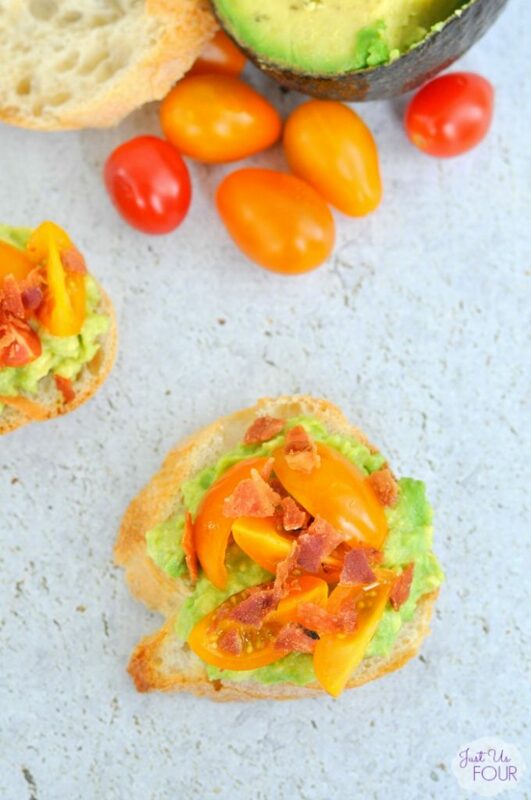 With just a few ingredients, you have the perfect appetizer that is full of fresh summer flavors. 1) Preheat oven to 375 degrees. Lightly brush one side of each bread slice with olive oil and place on baking sheet. Bake for 2-3 minutes or until lightly toasted. Remove from oven and let cool. 2) Add avocado to a bowl and mash. Add in salt and pepper to taste. Top bread slices with mashed avocado. Top with quartered tomatoes and crumbled bacon. If you didn’t want to bother heating up the kitchen on a hot summer day with the oven, you can definitely skip the bread toasting part. I have made it both ways and the flavor doesn’t really change if you don’t toast it but the bread just isn’t quite as sturdy when eating the crostini. Have you been using up lots of summer produce this year so far? What are your favorite quick party appetizers? 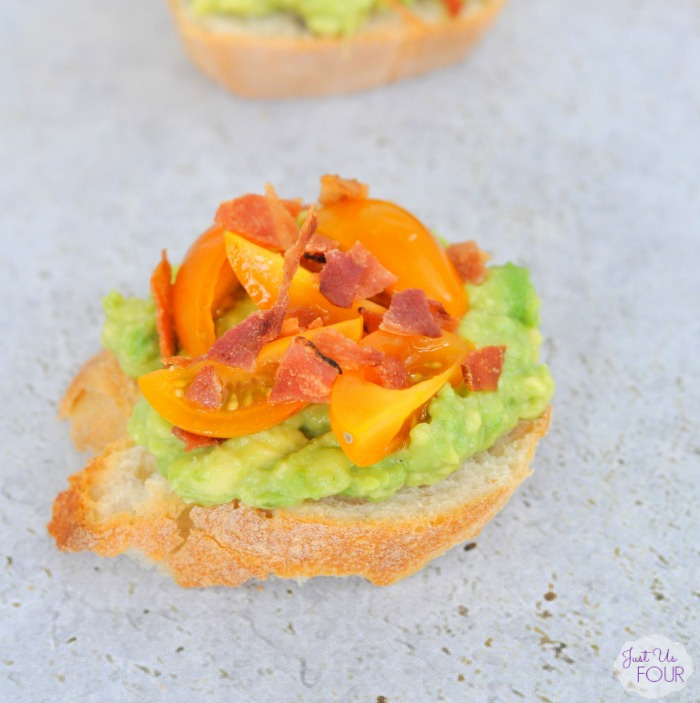 It’s like a blt… or a mexican crostini…. or just awesome! Great idea! Pinned! Those look so yummy! Thanks for sharing at #OMHGWW! I have to confess that I love anything with bacon period. I’m easy that way. Thanks for linking up to the Best of the Blogosphere Linky party! Avocados add such richness to recipes and they are also good for you, which is a real plus!! Thanks for joining us on Oh My Heartsie Girl Wordless Wednesday! 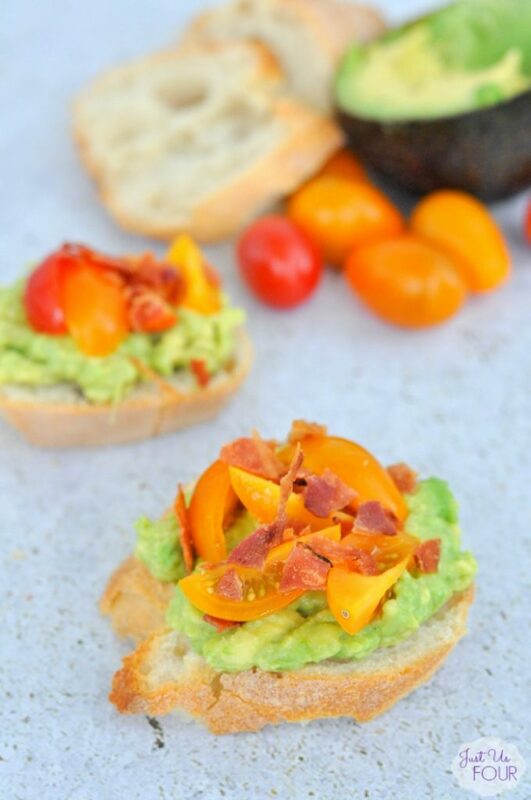 I am crazy for avocado and these crostini look so good! I am featuring you this week, over at Simple Supper Tuesday. We’d love for you to join us again this week, starting Monday night at 8pm EST.